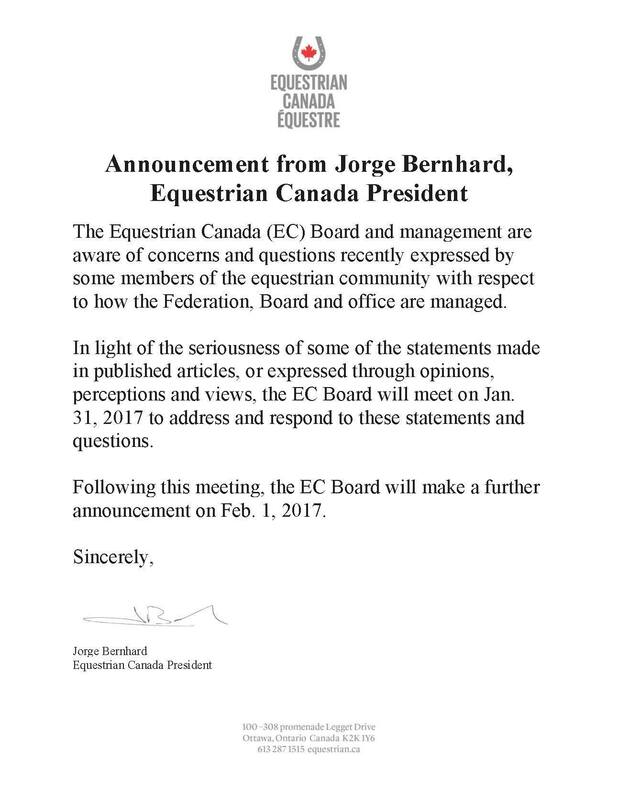 EC's Jumping Committee, known until very recently as Jump Canada, has issued an open letter to all EC stakeholders citing their grave concerns with the CEO and remaining Board of Directors. We have also included the contact email addresses for the EC Board of Directors and three Membership Categories should you wish to voice your thoughts. In an interesting turn of events, EC President Jorge Bernhard issued a statement which was posted to EC's Facebook page , stating that an emergency Board meeting will be held January 31, 2017 with a further announcement planned for February 1, 2017. As the Jumping Committee (formerly known as Jump Canada) of Equestrian Canada (EC), we are writing to share our grave concerns regarding the state of our organization under the current leadership of its CEO and Board of Directors. Although we have repeatedly raised our concerns through the proper channels, and did submit a letter to the Board of Directors and appreciated receiving a response, our fears continue to mount rather than be appeased. The Jumping Committee has lost confidence in the current executive leadership of EC, and is frustrated by the lack of urgency shown by the Board in rectifying this crisis. The very foundation of our Federation is in peril, and we will not stand by silently and watch it implode. As such, we wish to share our anxieties with a broader audience in an effort to unite the Canadian equestrian community. Simply put, we are alarmed by the path that EC has taken, and continues to pursue. Our national sport organization has spent considerable membership dollars on two commissioned projects, namely the Mushroom Cloud Report and the High Performance Task Force Report, and continues to move forward with both initiatives despite serious reservations from EC stakeholders. While the Board of Directors continues to offer reassurances that neither of these plans will be implemented without approval from the disciplines, we have already seen evidence to the contrary, creating further distrust of the current leadership. We also find ourselves dismayed by the lack of communication and veil of secrecy that now permeates the EC office. There is little to no consultation and even less transparency between EC and our committee on important issues impacting our discipline. This also extends to both the EC Board and its CEO, who fail to communicate policy decisions or provide financial statements, causing us to grow increasingly alarmed. Specific to the state of the Finance Department, EC is, to the best of our knowledge, heading into its third straight deficit year. The Jumping Committee has experienced great difficulty obtaining even partial financial statements during this time. This alone should be a massive call to action for the Board members who, in the absence of proper reporting, are unable to execute their fiduciary responsibilities as Directors. While we supported the streamlining of EC committees and the stated objective of improved efficiencies, the outcome has not been our experience as a discipline. We were forced to sacrifice the Jump Canada governance structure, which had served us so well for 20 years, in the interest of having one harmonized model across all of EC. This fundamental change in structure has led to less specific knowledge and experience within the EC office and a hampering of our ability to do our job, which is to serve our sport and its athletes to the best of our ability. The input and expertise of our volunteers in such crucial areas of coaching, officials, rules, and competitions have been removed from the Jumping Committee, and are now the responsibility of the EC office staff who lack the technical knowledge and skills to effectively manage such complex areas of our sport. The result has been missed deadlines, blatant errors, and incorrect publications. While our volunteers have persisted in their attempts to help, their efforts are met by a staff that repeatedly ignores and obstructs their valuable input. We are led to the conclusion that the organization is systematically denigrating and maligning the contributions and engagement of our extensive, experienced, and dedicated volunteer base. We believe the end result will be disastrous. We have tried to work within the system to no avail, and now feel that the current crisis warrants drastic measures. As your partner in this great industry, we implore the Canadian equestrian community to take our concerns seriously, and to join us in calling for an emergency meeting of EC members to form a consensus on next steps and further action.